Bullsh*t. SCOTUS only declared Obamacare constitutional based on the penalty being a tax. The complicated process of signing up for Obamacare is now being matched by IRS instructions to help Americans figure out how much in healthcare taxes they owe Uncle Sam. The agency has issued 21 pages of instructions, complete with links to at least three long forms and nine tip sheets. It is geared to those who have Obamacare or who owe a fine, dubbed “shared responsibility payment,” for refusing to get health insurance. 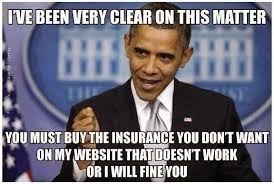 The IRS warned that everybody must have health insurance or pay the tax.